The Syllabus of Paper II of UGC CBSE-NET consists of more than 18 Subjects: Legal Theory, Constitution, Law of Crimes, Family Law, Labour Law, Law of Tort, Law of Contract, Public International Law, Environmental Law, Company law,Human Rights, Administrative Law, Negotiable Instrument Act, Consumer Protection Act. These subjects will make 100 objective questions in Paper II. Jurisprudence: detailed elaborative easy-to-remember content. Constitution: detailed elaborative easy-to-remember content. Criminal Law: detailed elaborative easy-to-remember content. Contract: detailed elaborative easy-to-remember content. International Law: To-the-point topic discussions on important international law subjects. Tort law: detailed elaborative easy-to-remember content. Human Rights: detailed elaborative easy-to-remember content. Environmental Law: detailed elaborative easy-to-remember content. Company Law: detailed elaborative easy-to-remember content. Administrative Law: detailed elaborative easy-to-remember content. Family Law: detailed elaborative easy-to-remember content. Labour Law: detailed elaborative easy-to-remember content. Jurisprudence and Constitution carry 25-30 marks out of 100 marks. For that two subjects, Short, summarized, objective-based material are provided. We provide hardcopy material containing important parts of all the subjects. Hardcopy will be delivered to your respective address within 7-10 days of enrollment. We provide online platform where you can access with the user id and password all the time from your desired devices like mobiles, tab, computer 24*7. We generally update the material within 10 days interval. 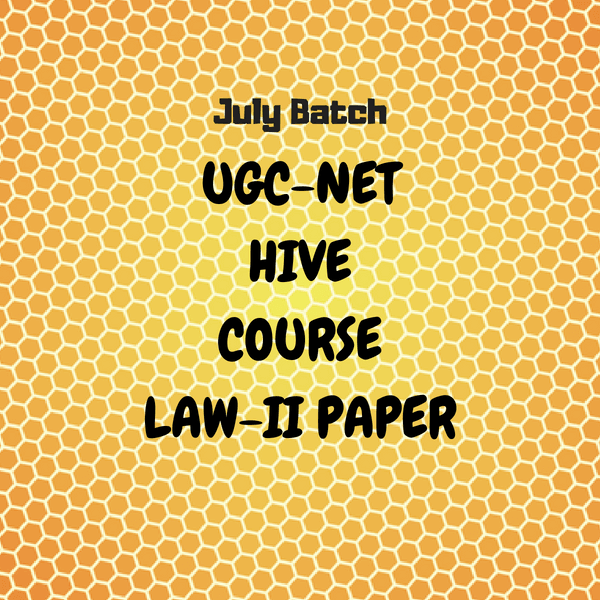 What is the difference between UGC-NET Law-Hive Course and UGC NET LAW LONG-Hive Course? Both the courses are designed for aspirants who are going for UGC-NET LAW exam. But Hive Course is for 6 Months and Long Hive Course is for 1 year. Is only softcopy provided in this course? No. Both Softcopy and Hardcopy will be provided in the Course. Can this course help me prepare for the exam? Obviously. Online Home assignment programme will help you prepare for the exam in a time-bound manner. As it is a online coaching service, you will not be forced to pursue the Online Home Assignment programme. If you wish, you can. Does this Course include PAPER I also? No. This Course only includes paper II of UGC-NET Law. Is the Course content updated regarding UGC-NET Law New syllabus? Absolutely. This Course is updated one. It is an online or postal Coaching, how will I get help if any problem arises? If you have problem, you will get our help 24*7. Whenever you need us, we will be there. Does This Course help while doing revision for the exam? Obviously. This course contains bonus material particularly designed for revision as well. Is there any video lectures in this course? No. there is no video lectures in this course. All the course content are made of PDF, PPT and Book Format. Is there any update of course content after enrollment of the course? Obviously. We regularly update the course content[online portal]. Also, if you want any more content on any particular content other than the content provided in the course, we will provide you with that as well.